Will a solar golf cart leave you stranded? Just when you thought having a solar golf cart was the answer oil prices have fallen right out of bed. Of course back in the summer of '08 we sat around slack-jawed and watched the price of fuel skyrocket. Everyone and their dog was convinced that oil was going to hit $200 a barrel in the not to distant future due to the increasing demand by countries like India and China. How wrong were we? Now we are in the middle of the fall and oil is on the verge of falling under the $60 level for the first time in 18 months! Well you know what?....The demand for oil over the next few years will continue to rise as we come out of this recession and the concept of having a golf cart that is run primarily on solar power is not only great for the environment it will also save tons of money in the long run. The concept of a solar cart is very simple and very efficient. The solar panels are located on the roof of the cart. These panels will charge the batteries, which in turn operate the cart. The panels can transfer as much as 180 watts of energy which will propel the cart at speeds up to 25 mph. If the batteries have been fully charged by the sun (which takes approximately 15 hours) you can get up to three hours of run time. Of course just like any other electric golf cart you can not only dress it up with your desired accessories but you can also have in converted to a street-legal cart. 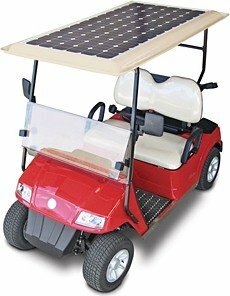 So if you think gas is eventually on the way back up and you like the idea of going green then a solar golf cart is very likely the best option. The base prices start in the $3,500 range and can run well over $15,000 if you need to have a load of options.